Anoka High School has announced 11 new Hall of Fame inductees that includes two Anoka Football legends. Prior to becoming Anoka High School’s head football coach in 1979, DeWayne Johnson had established himself as one of the premiere high school coaches in Wisconsin, where he won several conference championships and two state titles. A star athlete himself, DeWayne lettered in football, basketball, baseball, and track in high school and later earned hall of fame recognition for his football and baseball accomplishments at the University of Wisconsin, River Falls, as he earned his degree in math and business education. DeWayne became a math teacher at Anoka High School and took over the successful football program upon the retirement of Stan Nelson. Coach Johnson instituted several practices that became staples of the Tornado football program, a player-parent mixer on the first day of fall camp; a team pig roast; a spaghetti dinner the day before a game and a team party following the game; and the annual community clean-up day, during which players volunteer for various tasks to improve the local community. But it was for his teams’ on-the-field success that Coach Johnson is best remembered. Despite playing against the most talented teams in the state of Minnesota, the Tornadoes excelled. Anoka won conference titles in 1985, 1987, 1989, 1990, 1994, and 1995. The Tornadoes were section champions in 1990 and 1994 and runners-up in 1991, 1995, and 1997. And in 1990 and again in 1994, the Anoka Tornadoes won state championships. During the 1996 season, Coach Johnson won his 200th victory, and in 1996 he was voted the Minnesota High School Coaches’ Association “Coach of the Year.” DeWayne was inducted into The Minnesota State High School Hall of Fame in 2009. Coach Johnson was fortunate to have coached his two sons Brent and Bart, two outstanding athletes in their own right, and he credits his wife Sharon for many years of enthusiastic support to him, their sons, and to the entire Anoka football family. William “Bud” Rainbow lettered thirteen times at Anoka High School prior to his graduation in 1948. 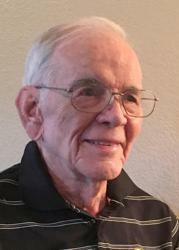 He earned the first of four varsity letters in football as a freshman on the historic undefeated state championship team of 1944. 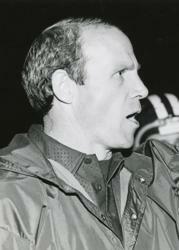 During the remaining years, Bud was starting quarterback on teams that won two more conference championships. In basketball, he earned four varsity letters and was selected as co-captain his senior year. That year the team was the region champion and made it to the state tournament for the first time in Anoka history. Bud was named to the all-region team. Baseball was another four-letter varsity sport with Bud serving as the starting catcher all four years and winning conference championships as well as the state title. Bud earned his final letter during his senior year when he qualified for the state track meet in the high jump. After high school, Bud earned four varsity letters at Iowa State Teachers’ College (now the University of Northern Iowa). In two of those years, the Panthers were conference champions, and in another year, co-champions. Earning a degree in physical education, Bud taught and coached in Iowa, the majority of those years in the Cedar Rapids Community District. In 1961, he coached the Washington High School Warriors to their first conference championship in school history and was named Coach of the Year by the conference. He went on to earn his Ph.D. and served the remainder of his career as the director of secondary education for the Cedar Rapids School District, while also serving on various education and community boards. He did not leave athletics behind though. He was an avid golfer who won local and city tournaments even after he officially retired. Bud and his wife of sixty years, Joy, had five children and twelve grandchildren. Today Bud resides in Arizona, still enjoys putting the golf ball, and following the adventures of his fifteen great-grandchildren.